I have spent many years chasing sunsets partly because I’m too darn lazy to get up for sunrises. I always tell myself to but I never seem to manage it. Over the years I have managed to come up with a few good spots to go for sunset to make up for these lack of early mornings. 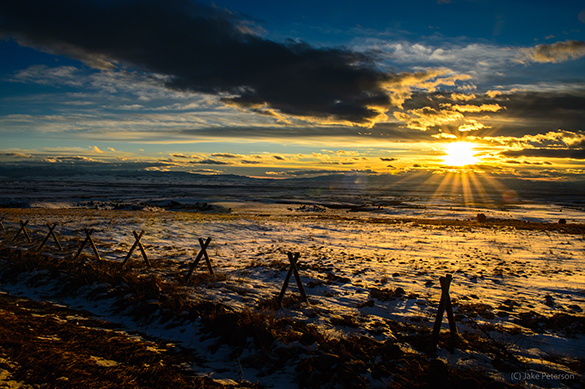 One of the things that I have learned is that Spring sunsets can be amazing here in Bozeman. They aren’t what you would expect. 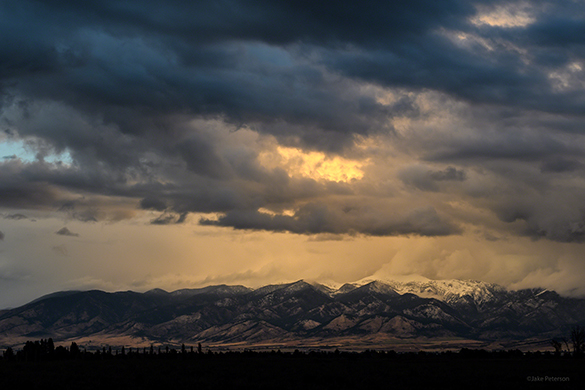 The way the weather moves through the valley often only a sliver of light is left on the mountains to the east as the clouds cover everything else in the sky. This narrow opening out west lets in just enough light to make some magic happen. It’s like that single ray of light on a dreary day to make everything better. It really does just take one image to make that whole time out with the camera worth while. When a storm is rolling through, dramatic clouds in every direction and the shots are plentiful then you know you have something good. But then they close up and that small window is gone leaving nothing but darkness, what do you do? You wait. When it comes to working the clouds of a storm it’s a matter of hurry up and wait. You rush out to where you want to be standing and then you wait for that moment when the heavens open up. This particular evening it didn’t open up like I thought it would but what did happen was pretty amazing. With the D5 and 24-70 AF-S I blasted away. Everything from 24mm to 70mm to high speed crop I kept looking for that one shot. This one was close but still not quite it. In all honesty the only way to get the shot was a 360 because everywhere was dark except this one spot. That’s when it pays to be out with the camera. Your longest lens maybe better for landscapes then anyone has ever told you about. A long lens, not a 70-200 but a 200-400 or bigger can be a great tool when it comes to landscapes. Not only does the extra focal length allow you to isolate small pockets of dramatic light but the nature of that glass combined with a shallow depth of field will really compress everything in your composition. This combo can lead to some very interesting images. Finding blog material isn’t always easy but sometimes it comes to you. This is one of those times. I was watching the storm of the Bridger Mountains all day and wouldn’t you know this one small spec of light opened up. 200-400 and the D5 was all that I needed to capture this brief moment and as you can see besides the little bit of light on the peak the rest of the sky just kinda sucked. So long lens technique for Landscapes should be in your arsenal. It’s not always easy to be inspired to shoot when the whole sky is nothing but a grey cloud. It happens a lot in the mountains especially the further north you go and sometimes you just have to get over it. It only takes a few seconds where the light pops through and then that whole wait and searching becomes worth it. It only takes that one little light. Now that Bozeman is back in the swing of having days of nothing but cloudy skies I think about the need to go versus the expected results. After many many trips out and not capturing anything because of the dark boring sky I can honestly say it can be disheartening. But occasionally, and last year proved that for me, there are moments that make it all worth while. This particular shot wasn’t planned but merely was the result of driving around with a camera in the lap chasing the light. You’d be surprised what you can come up with by driving around. There really is no other way to say it. Sometimes the best photograph is the big one. Pano’s have always been a specialty item when it comes to photography because it encompasses so much that every detail has to be important to the overall story. Then once you have the image how do you go about displaying it? And for the longest time taking all the separate photos and merging them was an art. Thankfully today it has all become a little bit easier to do those things allowing every photographer to go big. 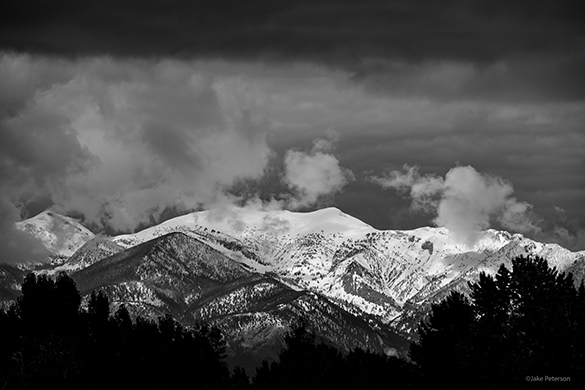 This shot I took last year of the Bridger Mountains is one that I always liked because it really represents what it’s like to live here in Bozeman. 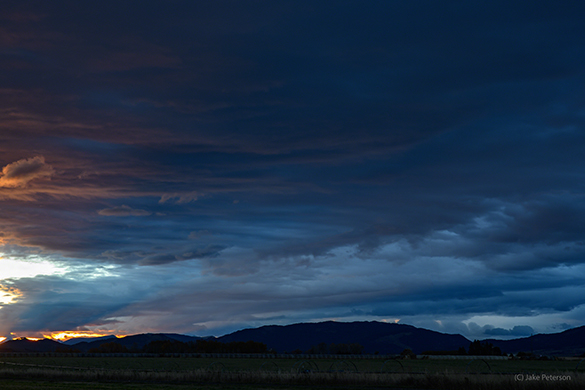 Thankfully with the tools now in ACR it takes very little time to create a Pano. Fall and Winter are two of my favorite times of the year but not for the reason most people think. I truly enjoy sleeping in making getting up for sunrise extremely difficult even though I know that getting up for sunrise often leads to better photographs. In Fall and Winter the days are shorter. Sunset is earlier and sunrise is later making getting up easier. 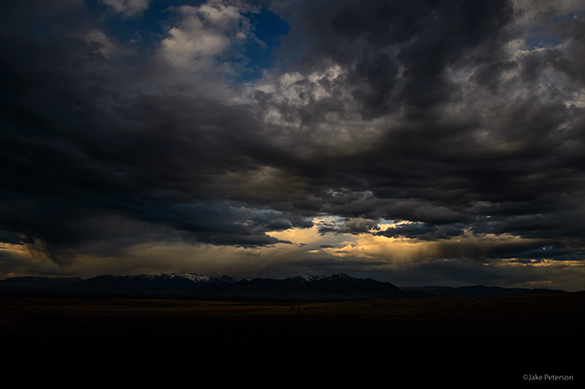 Well Fall also brings in great storms, thus making for really interesting skies to work with. this past Saturday was absolutely gorgeous as the sunrise was delayed due to clouds on to the east but as the cleared those clouds the rest of the sky light up with basically god beams. 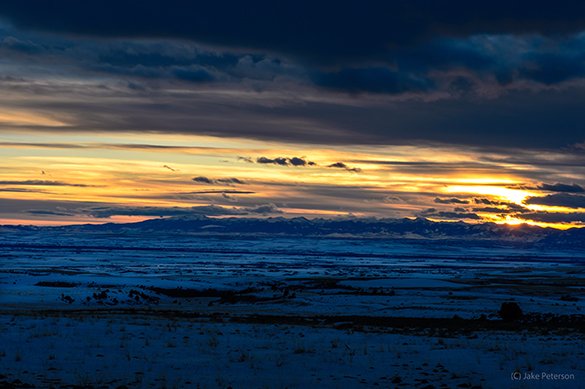 In all my years living here Bozeman I have not seen a morning sky like that. Naturally I was prepared for landscapes as I was about to go out fishing. Usually when I hit the water I take the 24-70 AF-S or 18-35 f3.5. But I was trying something new using the 85 f1.4. The longer range and narrower depth of field can make for some interesting images. However, for the sunrise it wasn’t quit what I needed. Nevertheless you have to make do or else you miss out. 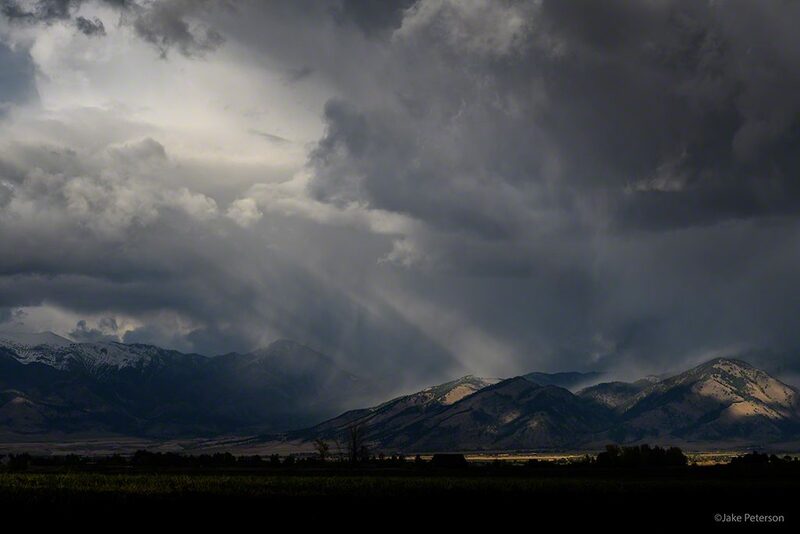 It’s gotten to be that time of the year where we start getting great thunderstorms rolling through in the afternoons in the Gallatin Valley. While this forecast does call for some snow this week, odds are it will turn to rain in the lower elevations and anything that accumulates will be gone in a day. Well over the next couple of months the weather will be some of my favorite to shoot in as the skies are always filled with drama. Yesterday was lining up to be one of those evenings where the skies were great but not a lot of light popping through the clouds. That’s alright there doesn’t always needs to be lots of light to make a great shot. In the absence of light comes drama and that’s what the skies did. With the D4 and 24-70 this was one click while underexposing -2.0 stops. 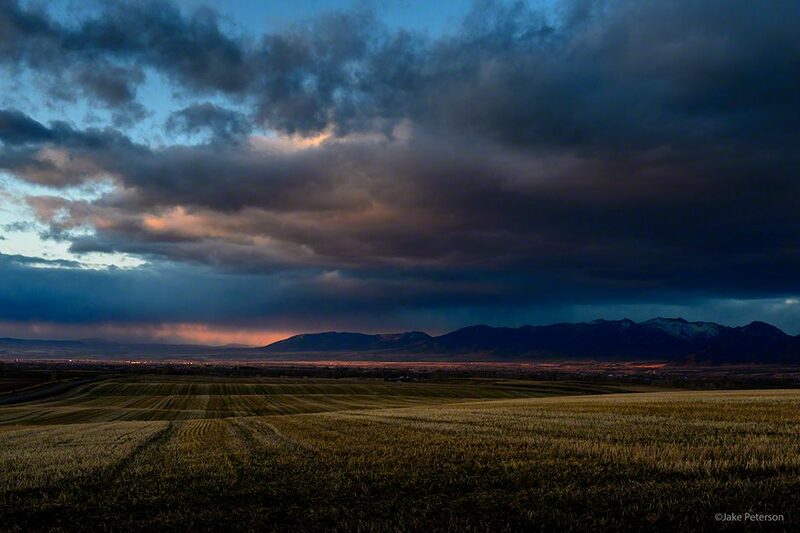 When you don’t have a great foreground or great light, just focus on the clouds. Snow can be so deceptive. I love it! 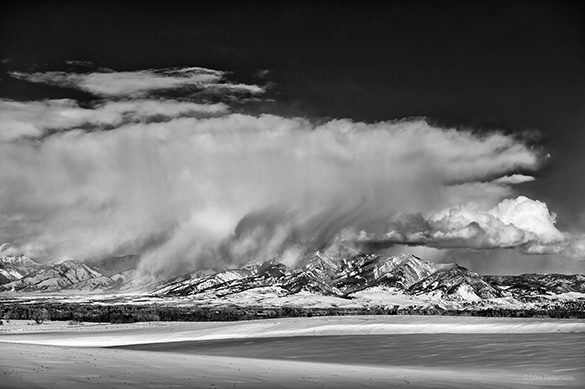 Working with snow can be as great a challenge as working with light. It just keeps changing. With the tiniest amount of direct light it becomes so bright that you can’t look at it but then as soon as that light disappears it becomes dark. Such a fun challenge to work with. 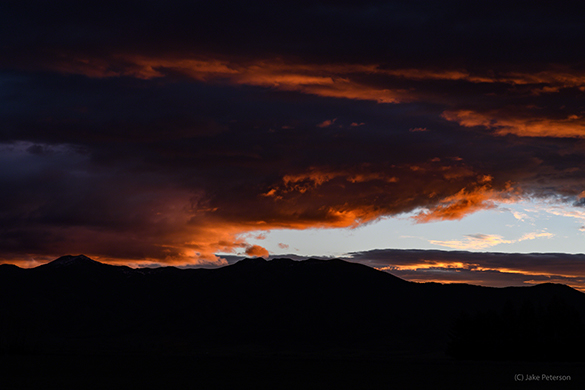 We’ve had some beautiful sunsets in the Gallatin Valley, many of which I didn’t have my camera present, but some I did. This one wasn’t the best but the speed in which it changed from being warm enough to have an open coat, to zipped up and gloves on was mere minutes. Feeling it was one thing capturing it was another. Just up in one of my favorite retreats with the D4 and 24-70 AF-S, nothing much but simple clicks that show just how fast everything changes. What was fun to watch was how fast the light on the snow changed with the light in the sky. That’s why I love snow.